We take pride in our decks. 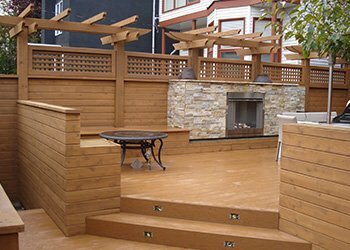 Mountain View Sun Decks is Calgary’s preeminent company for the design & construction of maintenance-free decks and railings. With more than 20 years of experience, this family-run business takes great pride in working with homeowners to help them build the right decking solution for their lifestyle. Our experienced professionals have everything they need in their toolkit to get your job done right, from start to finish. 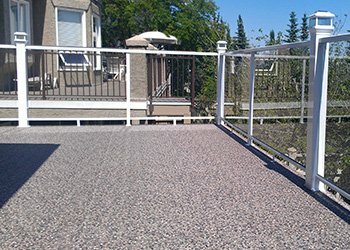 We build vinyl membraned decks which are perfect maintenance free options for walkout decks, rooftop decks, or anywhere you need waterproofing. We build everything from a simple on ground or walk-out deck, to multi-level, rooftop, or pool decks. Multiple options of materials to choose from, including cedar, pressure treated, kayu batu, PVC and Composite. Our custom-built stairs range from basic wooden steps to unique aluminum staircases – individual designs to perfectly match your home and style. 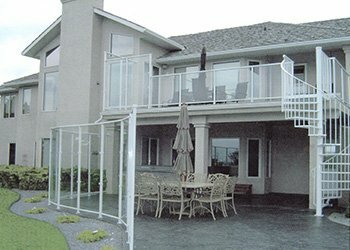 We have variety of railing designs, colours, and glass options to meet all your expectations for the custom glass railing systems, from clear view to privacy. 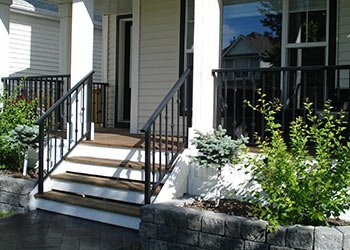 We have a variety of railing designs, colours, and ornamental options to build your outdoor aluminum picket railing and fence projects. Talk with us all you needs either repairing your existing deck, or the add-ons you like to have on your deck-pergolas, privacy walls,benches, fences, hot tubs, … we will make them happen! Mountain View Sun Decks is a leading planner, designer, and builder of quality deck solutions for Calgarians who want to enjoy the beauty of Southern Alberta from the comfort of their own homes. 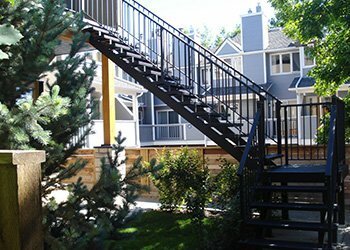 Since 1994, Mountain View Sun Decks has been constructing unique one-stop solutions for custom decks, stairs, railings, and gates across Southern Alberta. We offer a variety of materials, options, and custom designs to make your dream deck a reality. We are also experts in renovating old decks or patios, repairing heaved decks, or adding features such as stonework, privacy fences, screens, pergolas, and benches to further beautify your home. With a combination of your ideas, our high quality products, expertise and experience, Mountain View Sun Decks will build the ultimate space for you to enjoy. All of our products are custom designed and built to fit your house- no “one-size-fits-all”. All of our decks are built to last and are low maintenance. We only use highest quality materials, not only the material you can see, like vinyl, PVC boards, lumbers, railings, stringers, but also the material you can’t see, from glue to screws. We set high standards for installation and all of our installers are trained to comply these standards: We always recommend screw pile footings for decks which never heave or sink; our vinyl will be applied 6” up into the wall for perfect sealing; our aluminum railings and stairs are cut to fit and assembled in our shop and installed on your deck as a whole piece, etc. All jobs will be inspected, post-completion; to make sure it is done properly. No deposit requested. You pay after the job is done. We provide 5-year builder warranty for all our standard products. Plus manufacturer warranty. TufDek vinyl comes with 10, 15 or 20 years manufacturer warranty. Deck Rite vinyl comes with 10 years manufacturer warranty. Econo Dek vinyl comes with 10 years manufacturer warranty.